This week is one year since Trump's shock victory, and Esquire has a delicious oral history, "The Untold Stories of Election Day 2016." Deputy Editor John Hendrickson tells Axios: "15 people ... did the interviews, a mix of staffers and freelancers, then another 5 ... helped with supplemental editing and art as we hit the home stretch. Our last transcription came in as late as 5:30 p.m. this past Friday night." Steve Bannon: "Jared [Kushner] and I were out on this balcony in Trump Tower. We looked at it on Jared's iPhone. And the numbers were so bad that we regrouped inside. We look at each other and we go, 'This can't be right. It just can't.'" 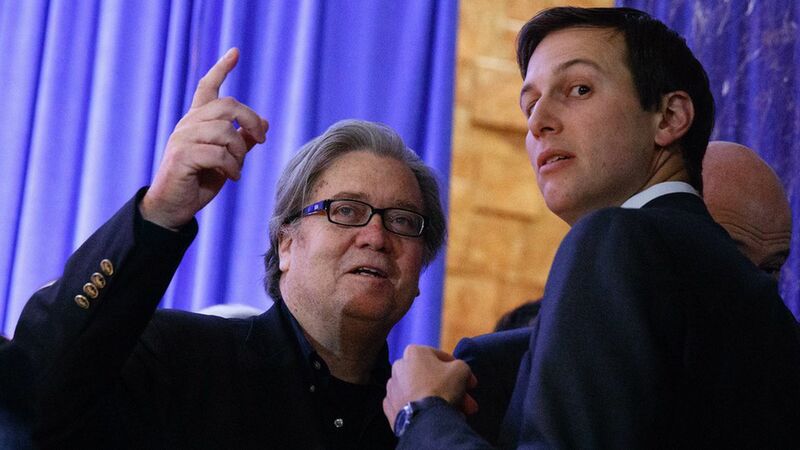 And Jared goes, 'I got an idea, let's call Drudge.' And Drudge says, 'The corporate media—they've always been wrong the entire time — these numbers are wrong.'" Ashley Parker of WashPost, then of N.Y. Times: "The RNC thought they were going to lose. The Trump campaign supporters thought they were going to lose. They were rushing to get their side out of the blame game. I spent part of my day lining up interviews for later that night or the next morning to get their version of events." Maggie Haberman of N.Y. Times: "One Trump supporter sent me a message saying, 'You're [screwed].' [Laughs] If you use that, please recall me laughing about it. It was really something." Michael Barbaro of N.Y. Times: "I went home and woke up my husband, I think it was 4 or 5 in the morning, and asked him what the next steps should be journalistically. Should I move to Washington? Should I change jobs? It was pretty disorienting." Relive it if you dare.